As time went on and Evan was getting older we were faced with panicked thoughts of another day lost and no treatment found. We grew more anxious that "someone" will find "it." The thing that will make it all go away. The thing that will make Evan like his brothers. The thing that will allow him to grow up and live an independent life. The thing that will stop crushing his will power to put down the food. "It" is the stuff of our dreams. We yearn for it with a desperation that can be likened to an addiction. We would do anything to gift this freedom to Evan and all like him. And so the plan for action began. 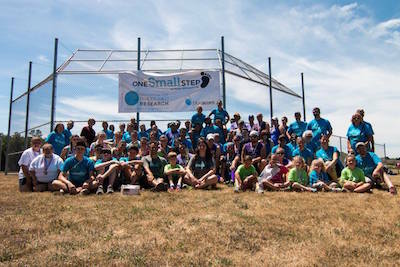 After several years of small fundraising activities, we felt it was time to dip a toe into hosting a One SMALL Step event. Excitement was building for us as we learned more about future areas of research. Evan had participated in some studies of PWS and we knew we had to do more to support the physicians and researchers dedicated to helping our family. We had attended One SMALL Step events hosted by other families and decided we should do our part and host and event. 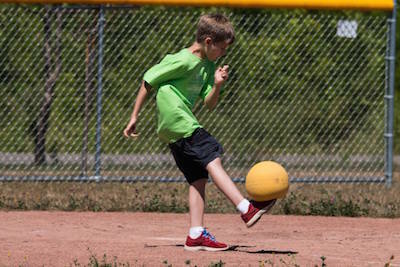 Michael has never been one to conform to the standard ways of doing things so he pushed for us to host a different kind of One SMALL Step, a kickball event. It was important to us to put on an event for all ages and abilities and most of all have fun! Resources were made readily available to us in our hometown but that meant putting together an event from 1000 miles away. Thankfully, we had help from family and friends in the area to store supplies, pick up local donations, set up space and break it all down at the end. One of the most memorable occurrences from our first event in 2015 was meeting a family from a rural part of WNY who had a teenage daughter with PWS. This family had never met or spoken to another family touched by PWS but through this experience we were able to meet and form a connection. Hosting for us means bringing together families to share in their experiences and raise each other up with support and comfort. We begin the day full of energy and end the event full of hope for the future of our children. 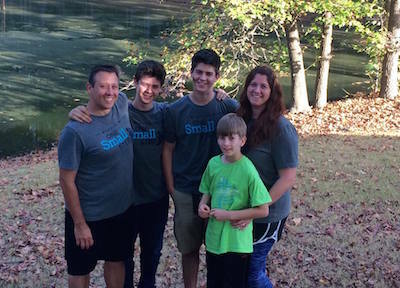 In just a mere 11 years of our PWS life, families around the world like us have made the decision not to be passive bystanders in how Prader-Willi Syndrome runs our lives. They are taking charge and changing the futures of our children. Our hope for a cure has been mobilized and we will not rest until PWS is no longer a threat and "it" is found. We ask family and friends for donations of hope so that our children may one day be unburdened by this syndrome that has a strangle hold on every decision we make, every action we take. We thank every one who has ever supported us, fundraised with us and who has given of their time to help us create awareness of PWS. I leave you with this thought: what if every single one of us touched by PWS took our own One SMALL Step. Now imagine your child’s life forever changed by your advocacy. That would be immeausurable! Sarah is FPWR's One Small Step coordinator. She became involved with FPWR shortly after the diagnosis of her daughter, Lily in late 2009. She first began fundraising through her “Running for Lillian” event where she and her friends raised funds for PWS research through peer-to-peer fundraising. Sarah joined the One SMALL Step team in 2012 holding her first of many walks in Bloomington, Indiana. Sarah has held multiple volunteer roles with our organization prior to joining our staff and was the chair of our Community Leadership committee from 2014-2015. She has more than 11 years of event planning experience with for-profit and non-profit organizations and hold a Bachelor of Science in Recreation with an emphasis in tourism, hospitality and event management from Indiana University.